On December 14, Charles E. McJilton, CEO of Second Harvest Japan (2HJ) and Ryan, Food Bank Philippines, arrived at the Leyte Island. Here is our field report, a summary of local supporting staff interviews and our report from the scene. 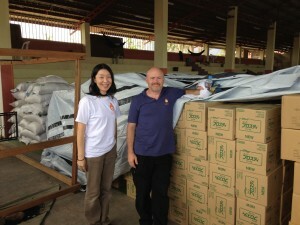 Q: You received many relief supplies already, do you think the people here need more? Do you have particular items in your mind that would be critical for the locals at this stage? A: First of all, rice (Indica rice, long-grain rice commonly eaten by Philippine locals), canned foods such as corned beef and canned salmon, and instant noodles. When we receive relief supplies that might be difficult for locals to use, we distribute them only when we can take time to explain the usages details, to avoid wasting them just due to lack of understanding the usage. Tableware, utensils, and cooking wares such as spoons, forks, plates, pots and pans are also in need. Non-breakable glasses and plates are handy. Q: I saw many coconut trees (palm trees) were damaged. It would take long time for them to recover, but what are your thoughts on agricultural business recovery support? A: A seed company, Rambo, provided seeds of agricultural produce such as pumpkins, okras, bitter gourd, string beans, eggplants, onions, and tomatoes. We have 28 villages here in Javier, with total populations of 28,000. We distributed these agricultural produce seeds to representatives of each villages as a part of our reconstruction efforts. Q: Would you tell us more about housings? A: Javier Mayer decided to provide materials to build temporary houses for those who lost their houses, as the first stage. The city provides materials, but they were told to build the house themselves. Disaster victims and the supporters are to share the burden 50:50. The second stage will be to provide permanent housings in the form of connected houses. We visited the typhoon disaster site one month after the incident, as we did for the East Japan Great Earthquake, to deliver relief supplies to the site. When I compared the situation between the two, I could not help but notice the greater damages to the houses and buildings at Leyte Island. An architecture specialist would know, but there seemed to be lack of earthquake resistant construction design, that houses seemed fragile. This probably was one of the reason for greater destruction of the town. People are making use of vinyl sheets to cover brown roofs or broken window. Also several organizations provided tents, and I saw people use them at several locations. > Necessary relief items: tents, plastic (blue) sheets, architectural consultations?? We collaborated with Philippines Police to prepare relief supply packages when a flood occurred in Manila, August 2013. A package for a family included the following: xxkg of rice, 3 cans of corned beef, 6 cans of canned fish, 4 packs of instant noodles, and 6 packs of instant coffee. Considering the needs of the Philippines, following can be considered 3 major food supplies in need: rice, canned foods (corned beef and salmons), and instant noodles. We learned from our experiences in the East Japan Great Earthquake relief support that nutrition deficiencies were found at shelters in Miyagi after one month of the disaster, due to lack of vitamins and minerals in relief supply foods. Nutrition supplements to provide necessary nutrients in balanced and effective manner are useful to support healthy recovery of the people who were affected by these natural disasters. We might need to arrange for nutrient supplements in the near future. Carbonated beverages are popular in the Philippines due to the hot weather and strong influence of American food cultures. Cola drinks are popular, and the hot weather calls for frequent intake of vitamin C. I think it would be good to provide vitamin containing carbonated beverages. Also, water is needed at all times. Throughout the day there, I was asked if I had enough water for myself. Locals were very conscious about water. Mineral waters were available to purchase in the Philippines at reasonable price, so it might not be on top of the list as a relief supply. It has already been one month past the disaster, but we saw many small children asking for food from cars passing-by. Children’s digestive organs are small, thus, they cannot eat lots of foods at one time. Easily digestible, energy rich, sugar containing snacks and sweets would be good for them. I saw several clean toilets, but also there was at least one that was not hygienically sound – no paper, broken flushing system, using water by ladles to wash out. Even during the East Japan Great Earthquake, excretions bagged in plastic bags were scattered around. Basketball is popular in the Philippines, like sandlot baseball in Japan, we can find basketball poles　along the roadside and street corners. I did not see inside of tents, but mattresses and blankets made with towels might help for a better quality sleep. If it is difficult, high quality sleeping bags would also be great for them. Power outage occurrence has been reduced, however, power generators are useful in case of natural disasters. One organization was distributing sanitary goods such as toothpaste and soaps. They utilized a name lists from communities and distributed these items one per person or household, at a gymnasium. We saw the needs for sanitary goods also at the East Japan Great Earthquake. The needs for sanitary/hygiene goods seemed to be the same for the Philippines after one month of the disaster. Also, masks might be needed as we saw sewage clean-ups and hole-digging for burials, as well as garbage incinerations. Women were using handkerchiefs to cover their mouths and noses, and men were using triangular scarves to cover their mouths. Masks are not as commonly used as in Japan. It is common in the Philippines to wash their clothes with their hands and dry them by hanging wet clothes on ropes outside of their houses. Sunlight is quite strong in the Philippines. Locals were using umbrellas as parasols to protect themselves from the sun. We saw many people using umbrellas at funeral processions of those who were deceased, during our stay this time. It might be possible to make a use of surplus umbrellas in Japan. It might be good to have radio as people can receive information while they are at work. Simple radio would be good. On the Leyte Island, I saw peoples’ ears were free even during their hands and bodies were busy such as when they were working on recovery work and packing relief supplies. Radio would effectively provide information in occasions of natural disasters. Used cars from Japan have been commonly found in the Philippines for some years. Buses with Japanese companies’ logos were used in Manila as well as in the Leyte Island. We also saw trucks with “Yu-Pack” logo of Japan Postal Services in downtown area in the Leyte Island. We saw other Japanese shipping companies’ trucks. We were told that coconut trees were damaged greatly. We saw tall coconut trees but many of them seemed withered and drooping. It takes more than one year to grow those trees damaged by the typhoon. Effects on coconut growers would be large. We saw green rice field at another location. We saw many national flags in the Leyte Island. Not all of them were proper flags, some were on sticks or on ropes. It is the time to endure as the country, and we felt peoples’ pride for the nation. I think the national flags were used as a sources for courage and their energy.